Are you brave enough? That is the question that will be answered by playing kimodameshi, the Japanese test of courage. You will have to walk a dark, lonely path to a haunted location and set down your token to prove that you had been there. Like most folkloric practices, the factual origin of kimodameshi is lost to legend. But there are two possible beginnings, both of which could be equally true. In the closing years of the Heian Period, during the reign of Emperor Shirakawa (1073 to 1087), the book “O-kagami” (大鏡; “Great Mirror”) was written by an unknown author. In the book was a story of three sons of Fujiwara Kaneie. One night during the Hour of the Ox (around 3 A.M.), the sons dared each other to go to a nearby house that was known to be the home of an oni. Only the son who was the leader of the martial arts school was brave enough to take up the challenge, and as proof of his courage he used his sword to slice a chip from the lintel of the house which he brought back to show the others. Whether the story of the sons of Fujiwara Kaneie is true or not is unknown, but it is also said that kimodameshi began as a way for those of the samurai class to condition their children against fear, and that the game served as a kind of training. 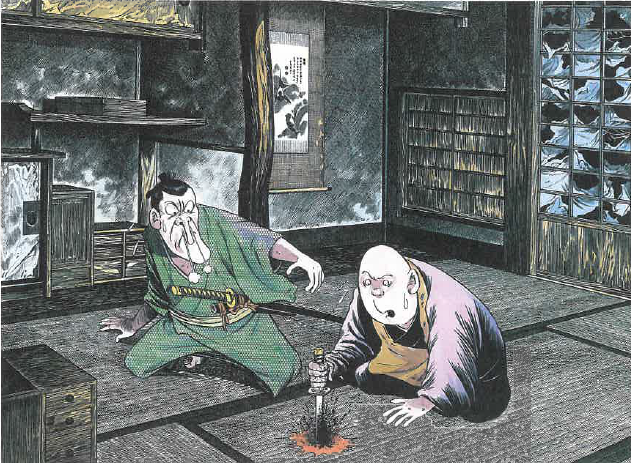 During the Edo period, the 100 candles game hyakumonogatari kaidankai—which this site is based on—was a form of storytelling kimodameshi. 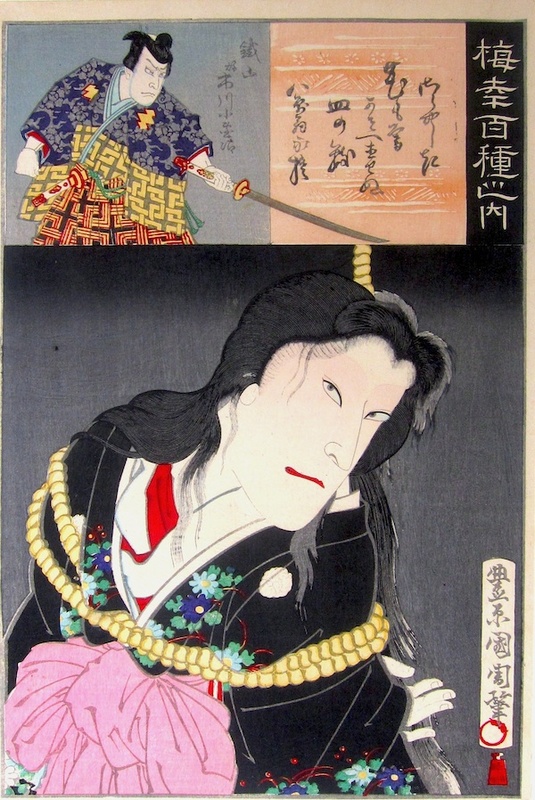 The earliest recording of this game comes from the kaidan-shu “Tonoigusa” (1660) where a group of samurai gather to test their courage by telling ghost stories one by one. There are no set rules to kimodameshi, and there are as many variations as there are people who play it. Kimodameshi can be played impromptu, with only a few friends egging each other on to go somewhere scary or haunted, or it can be an organized event with a preset course, often inside a prepared haunted house with actors playing the roles of spooks. In its most pure version, a group chooses a destination, one guaranteed to inspire fear. 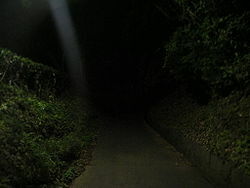 Common examples are dark forests, grave yards, Shinto shrines, abandoned buildings, or known haunted and mysterious spaces called shinrei spots. Challengers can go alone or as a duo. They go to the chosen spot at night, to ensure maximum fear, and they either bring something back to prove that they had gone the distance, or leave some sort of token that can be recovered the next day. Like all Japanese ghost traditions, kimodameshi traditionally takes place in the summer. 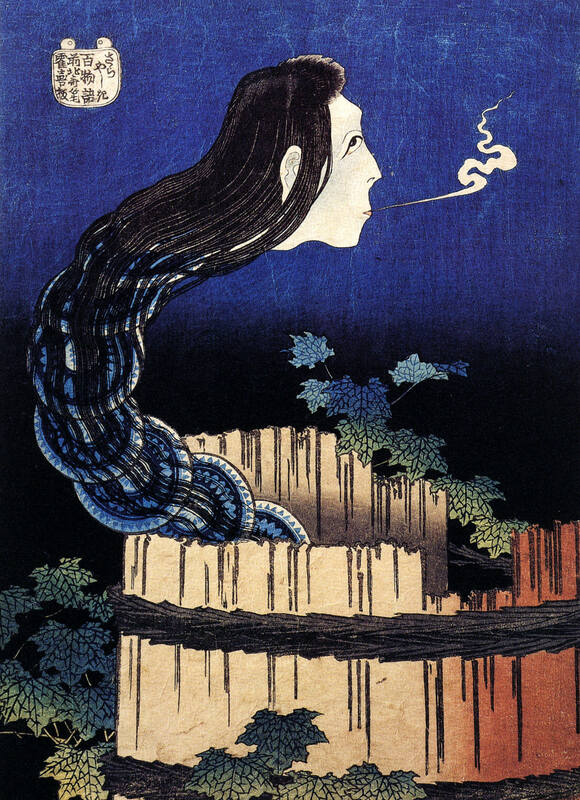 In Japan, summer is when the land of the living is thought to intersect with the land of the dead, and it is the time when yokai and yurei come out to play. All organized haunted house kimodameshi will take place during the summertime. It isn’t unusual to see TV celebrities during the summer being filmed walking through a haunted house or to some famous location in a game of kimodameshi. There are some legal issues with kimodameshi. When an abandoned building becomes a popular spot, the police have been known to set up stings to arrest trespassers. 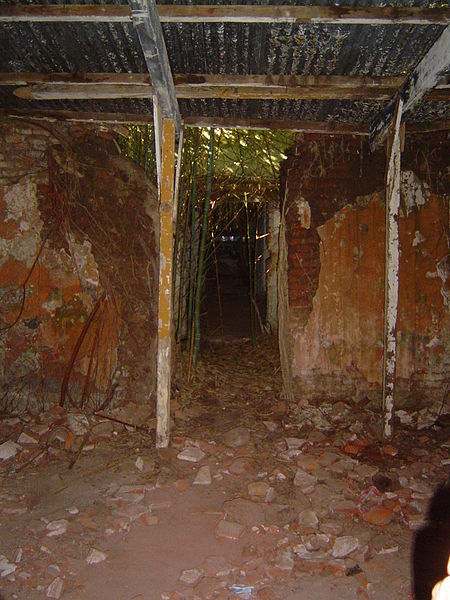 Some of the locations themselves are dangerous, such as long, dark tunnels on country roads where a car can come through at any time. Many Japanese people experience kimodameshi when they are young, in Elementary or Junior High School. The game is played when the children go on school camping trips, or sometimes at school during school festivals. When played with school children, the game is a set-up. In order to keep them safe, and still provide a good scare, the location is scouted before hand and scary objects like skulls and horror-props are planted along the way. Teachers and other volunteers dress in ghost costumes and hide along the path to spring out at the children. All of the students are told a scary story about that particular location, then sent off in groups to prove their guts once the Sun has gone down. Students can also create their own kimodameshi events at school during school festivals. They dress up in costumes and turn one of the classrooms into a haunted house for other students to enter and test their courage. This is a story from the Edo period. In Honjo, in Hirosagi-han fiefdom, a Daimyo of the house of Tsugaru had his mansion. Daimyo’s have two mansions, the kami-yashiki, where they live during their year of residence in Edo, and their shimo-yashiki in their native land. This mansion we are speaking of was the Daimyo’s kami-yashiki. At this Daimyo’s kami-yashiki, there was a tall observation tower that was used for fire-spotting. Fire was the bitter enemy of Edo period Japan, and these towers were a common site. You are probably familiar with them from the roll of a fire tower in the tale of the 47 Ronin. Aside from being high enough to spot any sign of smoke or fire, they were equipped with a large shaped piece of wood, called a bangi, suspended by ropes from the roof. Whenever a fire was seen, the bangi would be loudly struck as an alarm to summon the fire brigade. 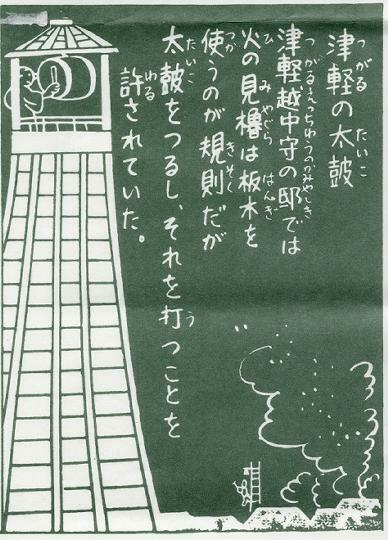 The mystery of the Tsugaru tower was that, when the alarm was raised, instead of the usual clack of a bangi the deep booming of a taiko drum would come from the tower. The townsfolk’s explanation of the mystery varied. Some said that the tower had a bangi like all the others, but that when struck the bangi sounded exactly like a taiko drum. They said that the bangi had come from a tree that was used to make a taiko, or that the bangi itself had once been part of a taiko, but this was just idle talk. There are some who say that the Taiko of Tsugaru was even less mysterious. They say that, instead of a bangi, the tower of Tsugaru simply had a large taiko drum. 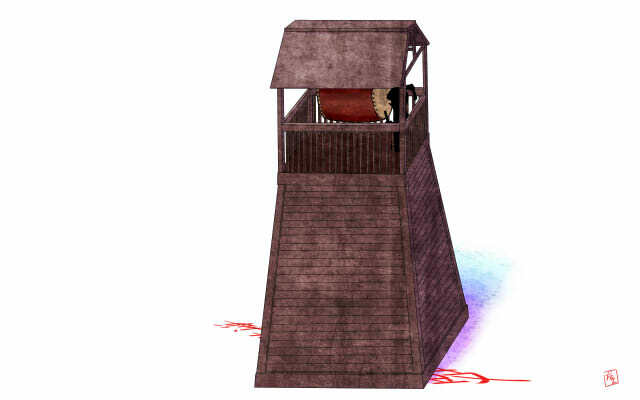 The reason for the drum, they said, was that because the fire tower was on a Daimyo’s kami-yashiki, the Daimyo’s didn’t want to use a bangi like everyone else. He just had to be different. Like all of the Seven Wonders of Honjo, the Taiko of Tsugaru was incorporated into Rakugo performances. However, due to the story’s lack of true mystery, it is the wonder most often omitted. The Taiko of Tsugaru, Tsugaru no Taiko (津軽の太鼓), is one of the Honjo Nana Fushigi (本所七不思議) meaning one of the Seven Wonders of Honjo. In Honjo, in the Hiradoshinden-han fiefdom, in the house of Matsura, there stood a Daimyo’s mansion. More than a simple mansion, this was the Daimyo’s kami-yashiki, where the Daimyo lived during his year in residence in Edo by edict of the Shogun. The Daimyo’s shimo-yashiki was in his native land, but the Daimyo currently resided in Edo. 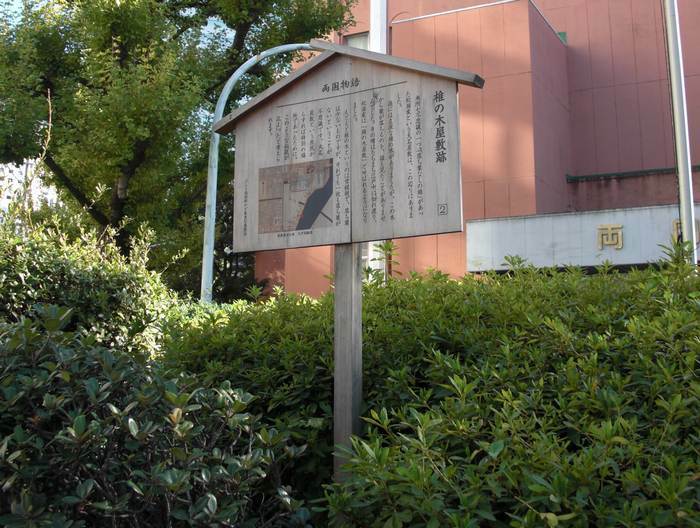 This kami-yashiki was bordered by a large wall, which ran parallel along the banks of what was then called the Great River, but what we now call the Sumida River of Tokyo. Planted in the Daimyo’s garden was a prodigious chinkapin tree whose leaves hung over the wall. The leaves from this tree never fell. Now, chinkapin trees are evergreen, not deciduous, but even then at least a few of their leaves fall with the seasons. But not the tree in the Daimyo’s kami-yashiki. No one had ever seen so much as a single leaf fall from its branches. The Daimyo’s gardener was a diligent fellow, but not even he could clean up every leaf that ever fell. This particular chikapin tree was truly a wonder. And what was the origin of this chikapin tree’s fantastic abilities? Well that is a mystery still to this day. 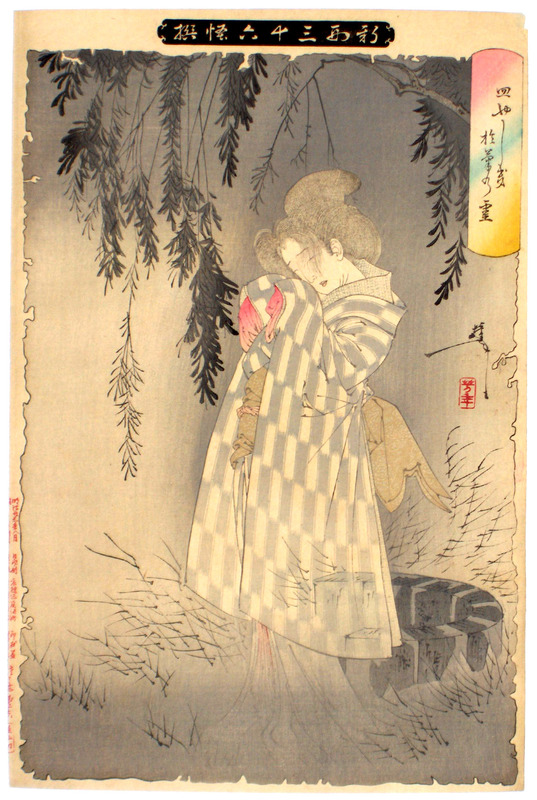 The Daimyo was unsettled by the tree—perhaps fearing some unknown fox power or mysterious spirits—and used his kami-yashiki as little as possible. But the fame of the tree spread until the mansion was no longer known as the Matsura house, but was locally called the Chinkapin Tree Mansion. 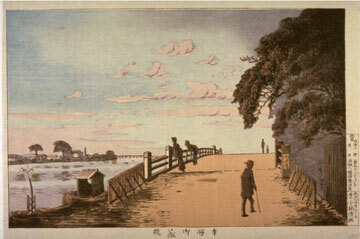 The tree hanging over the wall near the banks of the Great River was considered an elegant scene and was popular for strolls. 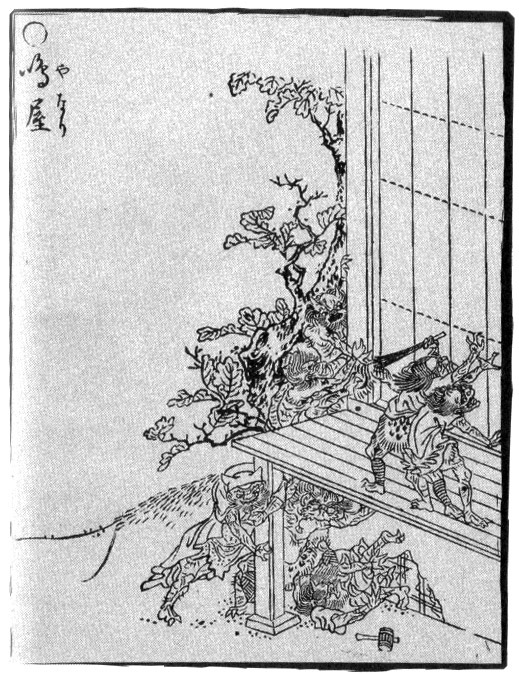 When the stories of the Seven Wonders of Honjo became popular in Rakugo storytelling, the Chinkapin Tree of Unfallen Leaves was included in the ranks. Neither the Daimyo’s mansion nor the famous chinkapin tree survive to the modern world. During the Meiji era, the territory was purchased by the Yasuda zaibatsu financial conglomerate who created a private garden called Yasuda Park. In the fifteenth year of Taisho, the Yasuda zaibatsu donated the garden as a public park. The park is now located in the Sumida ward, in the Honjo district. Like all of the Seven Wonders of Honjo, the old location of the Chinkapin Tree of Unfallen Leaves is marked with a sign and stone monument. The print is by Kobayashi Kiyochika and shows the Ochiba Naki Shii (落葉なき椎), one of the Honjo Nana Fushigi (本所七不思議) meaning one of the Seven Wonders of Honjo.